Explore the diverse landscape of southern Iceland during this 9-hour private tour from Reykjavik. In a 4x4 vehicle specially equipped to handle Iceland's rugged terrain, visit the looming volcanoes, tumbling waterfalls, dramatic rock formations and black sand beaches of the region. Learn about the history, geology and natural environment through your dedicated guide's informative commentary. This private tour ensures a flexible itinerary and personalized attention. Your private guide will meet you at your Reykjavik lodgings. Climb into the waiting 4x4 vehicle and set off for Iceland's south coast. Your itinerary is flexible and your guide will devote their total attention to you and your party, so let them know if there is anything specific you'd like to see or do. The 4x4 vehicle is specially equipped to handle Iceland's rugged terrain and allow you to get up close to many of the south coast's natural wonders. Make your first stop at the 'trout waterfall', or Urriðafoss, which cascades down the side of the Ice Age-era Þjórsárhraun lava field. After some exploring and photo ops, hit the road again in search of other waterfalls, such as the 196-foot (60-meter) Seljalandsfoss, surrounded by sheer cliffs. Intrepid adventurers can navigate the footpath that runs behind the waterfall. 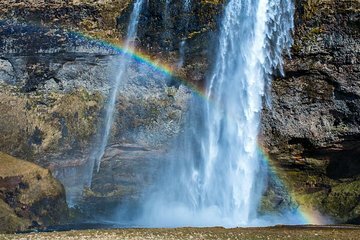 At Skogafoss, one of the biggest waterfalls in Iceland, marvel at the double rainbow that often forms in the droplets of mist on sunny days. Continue to Dyrhólaey, a 400-foot (120-meter) high headland cliff that juts out into the sea. See how the sea has eroded the promontory in such a way as to form giant hole in the land. Walk along the nearby black sand beaches in Reynisfjara, where you can marvel at the strength of the crashing waves, explore some sea caves, and take photos of the otherworldly basalt rock formations. This was an amazing experience for my group 6 people. We had taken a larger bus tour of a different area the day before and that trip pales in comparison to the personalized attention we got with Arctic Advanced's team. Our guide, Gunni, arrived to pick us up from our lodging rental apartment right on time. We climbed into the car and from the beginning, he made sure we were comfortable. He was able to gauge our interest and recommended two additional side stops we would have missed if we went on tour with anyone else. It was fairly cold when we toured early March and some of the pathways around waterfalls were icy, so he made sure to advise us where to walk to remain safe. During the drives between the stops, Gunni shared stories about the local area landmarks, background behind names, and tidbits on Icelandic culture from his local perspective. Great conversation, beautiful landscapes, and a tour I would repeat without any question. Everyone in my group said they would recommend Arctic Advanced tours to other friends and colleagues who are planning trips to Iceland, as well as taking trips again ourselves the next time we visit. Thanks for spending the day with us, Gunni!